Electrical power needs to be transmitted over longer distances from generating stations to electrical substations to be distributed to the consumers. Though DC transmission system was the first to born, soon it was replaced by AC transmission system. Earlier DC systems developed by the Edison's company could not transmit the power more than a couple of kilometers. Thus, only the customers within that much short range of the dc power plants could get the power supply. As the transmission distance increases, voltage drops significantly due to the I2R loss. A solution for this is to increase the transmission line voltage. But, there was no convenient way to change the voltage level of DC power. With the development of AC, it became very easy to change the voltage levels of AC power using transformers. Power could now be transferred over longer distances using AC, by stepping up the voltage level for transmission and stepping down again for utilization. A vast majority of transmission systems today use three phase High Voltage AC (HVAC) power. But, the developments in power electronics made us reconsider the DC power for transmission purposes. The AC vs. DC question has been around since the era of the war of currents. A major problem that Edison could not solve was how to increase the transmission voltage of DC for transmitting the power over longer distances. With the development of mercury arc valves, it became easier to convert the power between AC and DC. The AC power could now be converted into DC after stepping up the voltage using a transformer and, at the end of the transmission line, it could be converted back into AC for stepping down. This made High Voltage DC transmission technically feasible. Using this technology, the world's first HVDC transmission link was built by ABB in the late 1950s. However, the converter equipment was very large and expensive and required a lot of maintenance. Soon after, solid state thyristor valves were developed. They were smaller and cost effective. Improvements in power electronics are responsible for the big improvements in HVDC technology. Today, HVDC technology is used as a highly efficient alternative for a huge amount of electric power transmission and for interconnecting power grids with different frequencies. DC transmission requires fewer conductors than AC transmission - 2 conductors per DC circuit whereas three conductors per 3 phase AC circuit. HVDC allows line supporting towers to be smaller and, hence, requires lesser right-of-way. Thus, clearly, HVDC transmission line would cost lesser than an HVAC line. However, the terminal converter stations in HVDC are much more expensive which are not required for HVAC transmission. 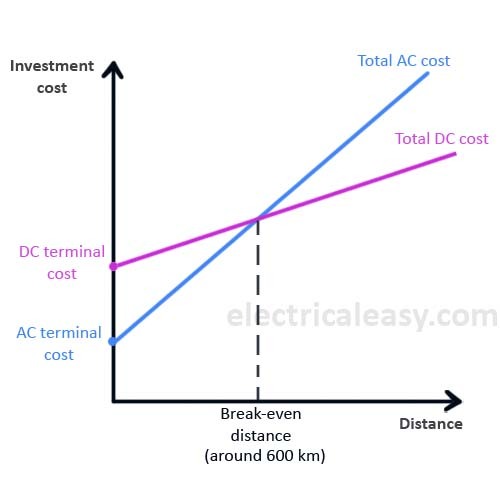 Over a specific distance, called as break-even distance, HVDC line becomes cheaper than HVAC. The break-even distance for overhead lines is around 600 km and for submarine lines it is around 50 km. Skin effect is absent in DC. Also, corona losses are significantly lower in the case of DC. 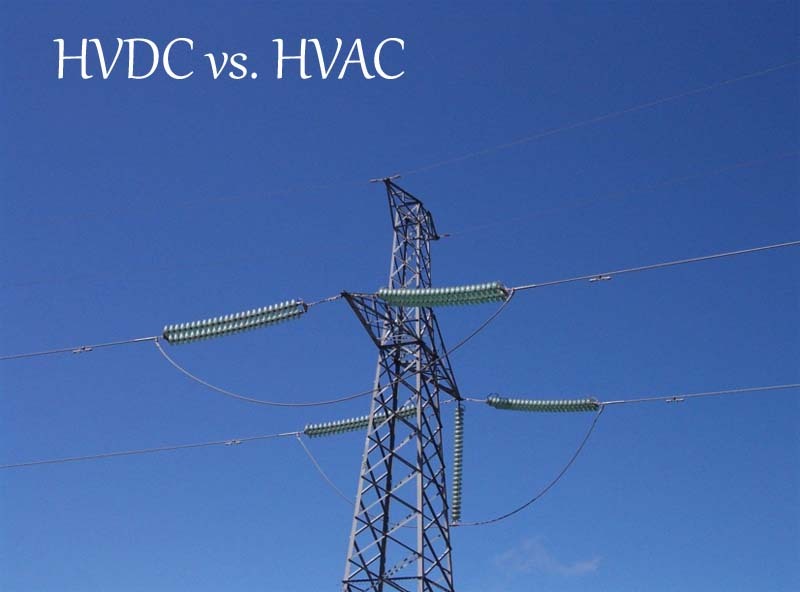 An HVDC line has considerably lower losses compared to HVAC over longer distances. Due to the absence of inductance in DC, an HVDC line offers better voltage regulation. Also, HVDC offers greater controllability compared to HVAC. AC power grids are standardized for 50 Hz in some countries and 60 Hz in other. It is impossible to interconnect two power grids working at different frequencies with the help of an AC interconnection. An HVDC link makes this possible. Interference with nearby communication lines is lesser in the case of HVDC overhead line than that for an HVAC line. In longer distance HVAC transmission, short circuit current level in the receiving system is high. An HVDC system does not contribute to the short circuit current of the interconnected AC system. HVDC transmission system has many more advantages over HVAC, such as stability, controllability etc.. For distances longer than the break-even distance, HVDC system becomes more cost effective. Submarine HVDC links can be more suitable for connecting offshore wind farms as they prove to be more efficient and cost effective than undersea HVAC cables. Hence, there is an increasing interest in HVDC transmission. Still, HVAC system will remain much longer as it has its own advantages in transmission and distribution, such as it can be easily stepped up and stepped down. HVDC is actually a complement for AC systems rather than a rival.